Betsy would like to thank all of you who voted for the Tex-Mex dish in last week’s poll. She didn’t actually vote and when she saw the results she sighed a sigh of relief. Of course, I explained that much like in a democracy… you can’t complain if you don’t vote! But she got lucky on this one. I’ve made a tex-mex style stack before, but this one is a bit more themed around ingredients that normally go in a crunchy beef taco. It’s just layered instead of stuffed which makes it fun! Really good taco ingredients layered between crispy fried corn tortillas. A really fun way to get your Tex-Mex fill. 1) Add oil to a large skillet over medium-high heat. Once hot, add one tortilla at a time. Cook tortilla for 15 seconds and then flip. 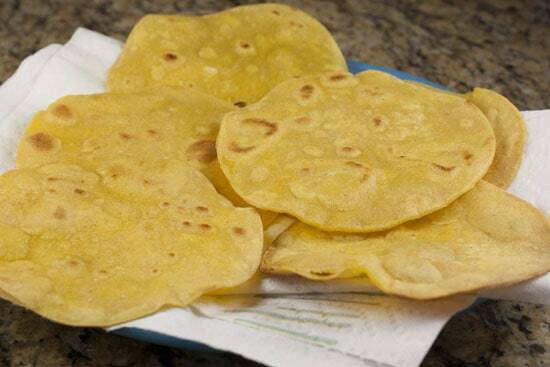 Cook for a total of 2-3 minutes until tortilla is slightly browned and crispy. Flip occasionally. Then let drain and cool on a paper towel. The tostada will continue to crisp up as it cools. 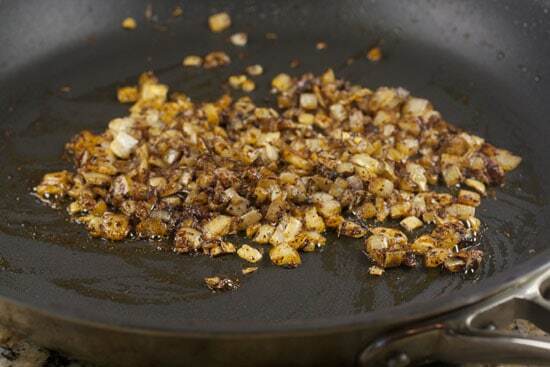 2) For beef mixture, add diced onion and garlic to a large skillet with a drizzle of oil. Cook over medium-high heat until veggies start to soften, about 3 minutes. 3) Add spices and continue to cook until fragrant, another 2-3 minutes. 4) Add beef and cook until well-browned. Then add chilis and tomatoes and continue to cook until tomatoes cook down, another 5 minutes or so. 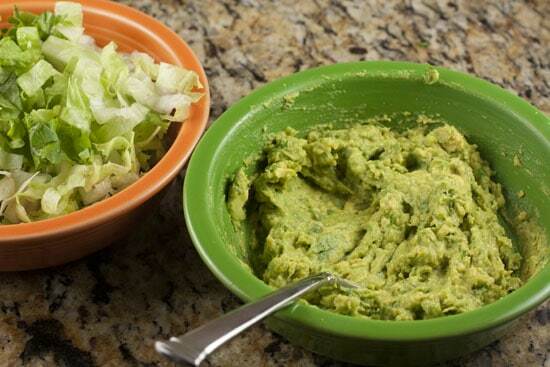 5) Grate cheese, chop lettuce, and make quick guacamole. 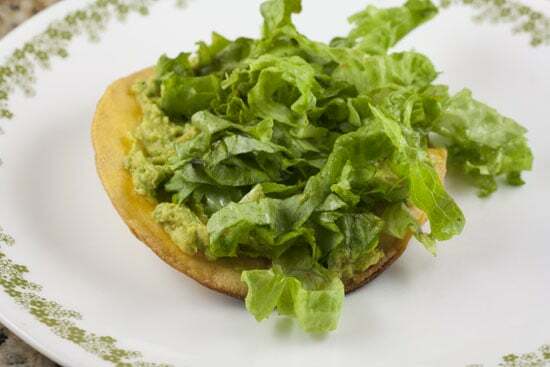 6) Slather bottom tostada with guac and add a handful of lettuce. 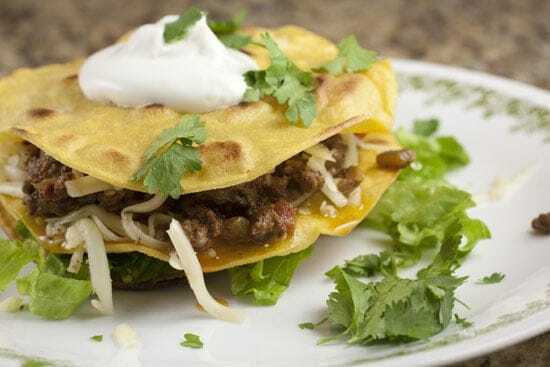 Add a second tostada, then cheese, beef, and more cheese. Top with final tostada and a dollop of sour cream. You can buy pre-made tostadas in the store these days, but I still like to make my own. The pre-made ones are much thinner and therefore they get soggier and just don’t hold up as well to something like this. Frying your own isn’t hard. Just add a good drizzle of oil to a large skillet over medium-high heat. Once it’s hot, add a tortilla and let it sizzle for 15 seconds, then give it a flip to get both sides cooking. Cook tortillas for 2-3 minutes total, flipping occasionally. Once the tortillas are done, let them drain on a paper towel briefly. As they cool, they will continue to crisp up. I really don’t love pre-mixed taco seasonings, but you could definitely use one if you wanted. I’ve found a combination of spices that I think makes for a really delicious taco seasoning. 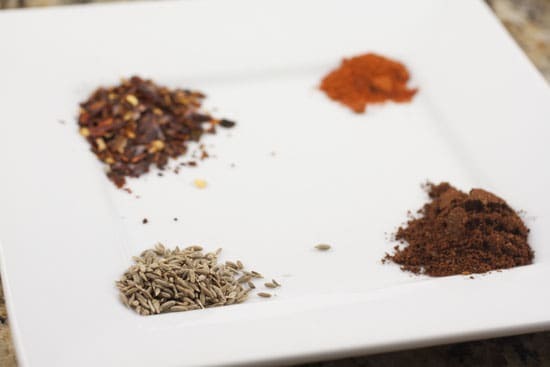 I sometimes play with it a bit, but it almost always has these four flavorful spices: cumin, red pepper flakes, cayenne pepper, and chili powder. When you’re ready to cook the filling, add a drizzle of oil to a large skillet over medium-high heat. Once it’s hot add the onions and garlic and let them cook until they start to soften up, about 3 minutes. Then add all of your spices and stir it all together. The spices will toast and become really fragrant as the onions continue to cook. 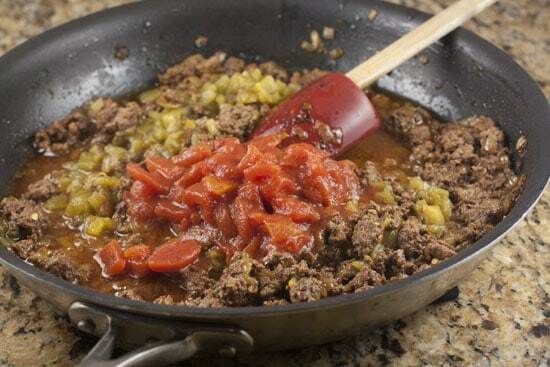 Add the ground beef to the onion mixture and continue to cook until the beef is well browned. Then stir in the green chilis and diced tomatoes. Stir this all together and cook for another 5 minutes or so until the tomatoes cook down and most of the liquid is out of the pan. Taste it and season with salt and pepper. Since this is a taco after all, there are a few other ingredients that I consider to be essential: Grated cheese, lettuce, and guacamole. For the guacamole, I went pretty minimalist here and just mashed up avocados and some diced cilantro and then added the juice of half a lime. There’s nothing too scientific about the stack, and you could stack your ingredients in any order really, but I like this order. Start with one tostada and slather on a good helping of guacamole. Then pile on some lettuce. The guacamole will help the lettuce stick around. 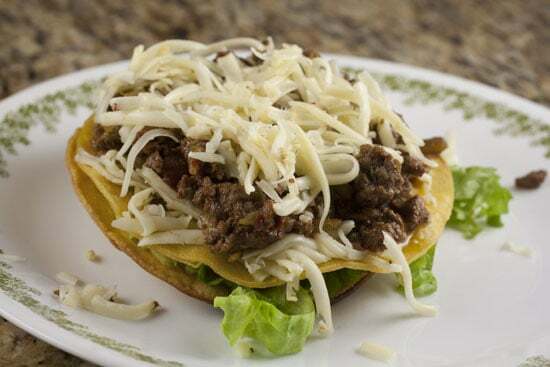 Then add a second tostada followed by a handful of grated cheese. Then top with your hot beef mixture and add another handful of cheese on top. The hot beef will melt the cheeses and the middle tostada will keep any liquids from making the lettuce soggy. 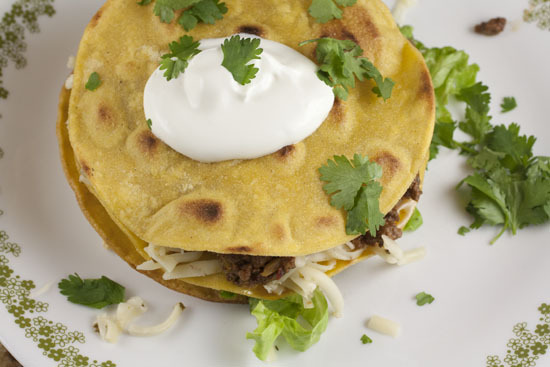 Top with your final tostada and add a good dollop of sour cream and some extra cilantro if that’s your thing. Not only was this completely delicious but it also turned out to be a really pretty dish I think. Well, pretty for a taco anyway. It might seem like the best way to eat this is with a fork and knife, but Betsy and I discovered that the best way to eat it is to literally just pick it up and eat it with your hands. The guacamole and melted cheese will keep everything together. It’s a bit messy, but so is a taco so just go with it. Made this last night. OMG it was delicious!!!! Thanks for sharing a wonderful recipe!! Lucky for Betsy!!! :-) Hey, this sounds great! But you really should try some Himalayan pink salt. I get mine from Sustainable Sourcing https://secure.sustainablesourcing.com. The flavor is so much better than regular salt! Thanks for sharing this recipe—I can’t wait to try it! It's kind of like a "Mexican Big Mac" only it has none of the crap that makes a Big Mac so nasty! Love this one Nick.